Everyone needs a HOME. HOMELESSNESS is not limited to a human concern. We are ONE family and ALL OUR RELATIONS – the plants,animals … all are experiencing the same profound loss of HOME on this earth. We all feel the loss. 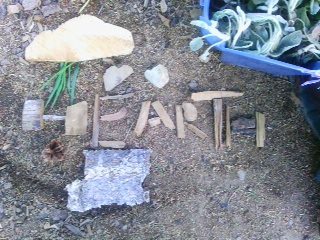 HEARTH's vision is to create a permaculture land bank, a model that can be reproduced anywhere whether through land donations or co-partnerships with land owners or many other possible strategies.The idea is to be a land clearing house and new economic model which will support permaculture practices,regenerative thinking and projects through reviving the spirit of the second American Homestead Act ( created during the Depression).H E A R T H is the brainchild of musician/poet/CO-founder of ACE,Chordata (non profits)/social activist and long-time homelessness advocate,Liz Gilbert..
artist in residencies and a permaculture,water and native plant conservation ongoing demonstration garden. Liz refers to H E A R T H as being like Farm Aid because it will depend on the collaborative effort of many musician and artist friends and organizations to promote the initiative. The project that we would first like to support through funds coming to ASR LLC (10 % of all profits ) and through independent fundraising efforts, is the creation of a Ra Paulette Trust and the purchase of 208 acres with two of his finest caves. Ra Paulette is the epitome of ARTIST with a capital A and stands for all we represent about the importance of supporting artists and their work, and BETTER while they are still alive! Ra Paulette digs cathedral-like, 'eighth wonder of the world' art caves into the sandstone cliffs of Northern New Mexico. Each creation takes him years to complete, and each is a masterwork. But patrons who have commissioned caves have cut off nearly all of his projects due to artistic differences.Fed up, Ra has chosen to forego commissions altogether and create a massive, 10-year project, his Magnum Opus.